An important aspect of lighting to consider is what function the light serves in the room. Light-emitting diode bulbs (LEDs) are showing up in the marketplace in various shapes and sizes with promises of long life and better quality of light than compact fluorescents. These bulbs (known in industry parlance as lamps) last so long that it’s worth taking the time to learn more about them and to choose wisely, because they will be part of your home for a good many years. LEDs are the newest of four lighting technologies, all of which are in use today to some degree. Incandescents date to Thomas Edison’s lab in the late nineteenth century. However, 95% of the energy used by these bulbs generates not light, but heat—as anyone who has used an Easy Bake Oven can attest. Halogen bulbs are a “new and improved” incandescent, about 30% more efficient and longer lasting, but surpassed in both respects by fluorescents and LEDs. Compact fluorescent lamps (CFLs) represent a significant leap in energy efficiency and service life; they are three to four times more efficient than incandescent bulbs and last up to ten times longer. However, they take up to five minutes to warm up fully and can burn out prematurely when hanging down from the socket, such as in recessed “can” fixtures. Moreover, many people don’t like the quality of fluorescent light. LEDs are five times as efficient as incandescents and can last up to 25 times longer while generating a better quality of light. 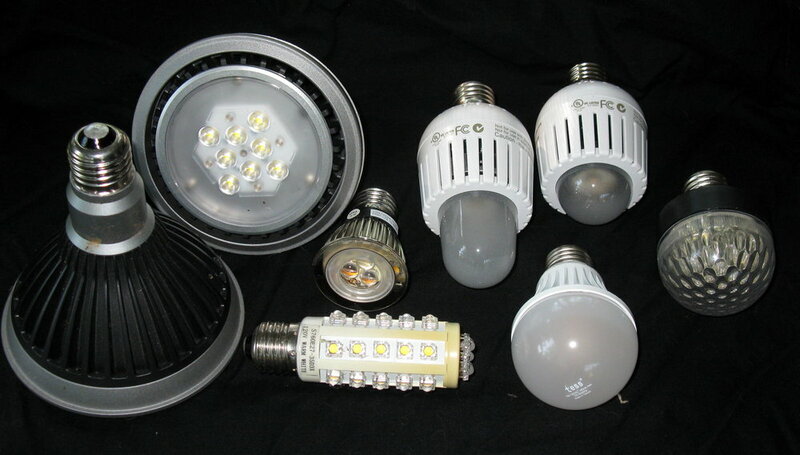 Unlike CFLs, they come up to full power immediately, and many are dimmable. Another aspect of lighting to consider is what function the light serves in the room. Omnidirectional ambient light provides overall illumination. Chandeliers, ceiling- or wall-mounted fixtures, recessed lights, or track lights provide this type of lighting. In the kitchen, ambient lighting might include a central chandelier and/or recessed lighting placed around the perimeter and 30 inches away from the wall. Task lighting is used in areas where you do specific activities, such as food preparation, reading, or paying the bills. Kitchen applications include under-cabinet lighting for countertops—place them toward the front of the cabinet so light is distributed evenly. Over the range or sink, task lighting could be comprised of recessed downlights for the places where you cook and wash dishes. Over the table, a pendant light is a common solution; for an island or breakfast bar, a group of miniature pendants can provide both ambient and task lighting. Accent lighting has a more decorative function, calling attention to aspects of the room that create visual interest, such as plants, art, or an exposed brick wall. To attract attention, accent light needs to be much brighter than the general lighting level. Recessed lights, track lighting, or wall-mounted picture lights are usually used. Just like a food label that tells you nutrition facts such as calories, fat, and fiber, light bulb packaging will include technical information that you can use to compare one bulb to another and to choose the right one for the job. The first important measure is lumens, or how much illumination the bulb emits. We may be used to buying bulbs based on watts, or how much energy is consumed. Now that efficient bulbs have changed the equation, it is more useful to shop based on lumens rather than watts. To replace a 60-watt incandescent bulb, look for one that provides 800 lumens. For 40 watts, look for 450 lumens. For 75 watts, look for 1,100 lumens. For 100 watts, look for 1,600 lumens. The temperature of the light—cooler or warmer—is measured in kelvins (K). A level of 2,700K is comfortable for most people. A lower number will yield warmer light, and a higher number gives cooler light (3,000K and higher). Outdoor light is 4,500–5,000K. The beam angle is defined where candlepower falls to 50%. Beam angle is the width of the cone of light coming from the source (as measured from where the intensity of the light drops to 50% of maximum). A narrow spotlight might have a beam angle of 30 degrees, while a floodlight emits a beam of up to 160 degrees wide. It’s best to compare using numerical values, because different bulb shapes may be described with different terms. For kitchen lighting from the ceiling, a beam angle of 40–60 degrees will provide a consistent level of light on the surfaces being illuminated. Over the sink, a beam angle of 20–30 degrees is often used, with lights placed closer together. There are a lot of variables to consider, but increased knowledge about lighting types, applications, and technical specs will help you find the right lamp to provide the illumination you need while saving energy and reducing your carbon footprint.